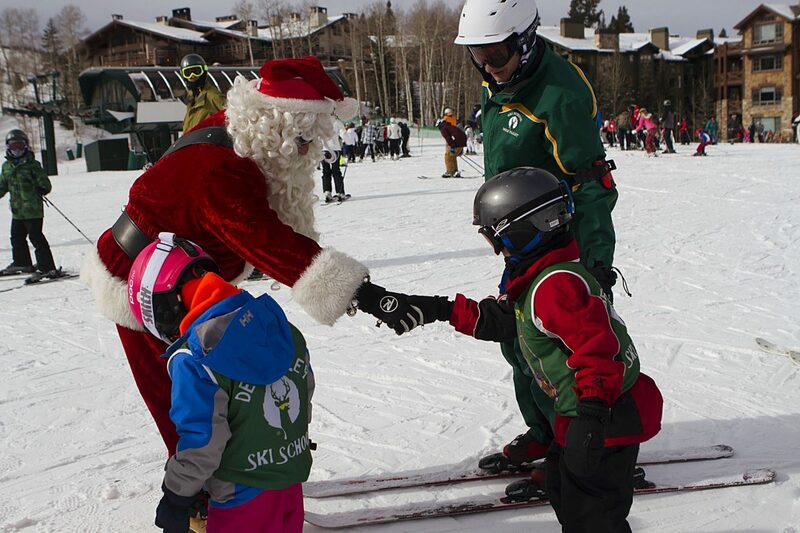 Santa visits Deer Valley Resort on Christmas Eve Day. Silver Lake area. Families and kids who want a last-minute visit to— Santa Claus should head over to Deer Valley on Christmas Eve day. Every year Kris Kringle makes his way to the resort to mix and mingle with guests and visitors before he takes off on his worldwide tour that evening, said Emily Summers, Deer Valley’s senior communications manager. Santa will start his day at 9 p.m. at the Snow Park Lodge. “He’ll be in the area by the base until about 11 a.m., and will go by the Children’s Center and spend more time there,” Summers said. A noon, the happy toymaker will head over the Silver Lake Lodge at the mid-mountain area. Summers said it is important for Deer Valley to continue inviting Santa to the resort, especially after its acquisition by KSL Capital Partners, LLC, and Henry Crown and Company, which also owns Mammoth Resorts and Squaw Valley Ski Holdings. While these guests forward to coming back to Deer Valley year after year for their holiday celebrations, Summers and the Deer Valley staff see the importance of continuing this event. “Our mission statement at the resort is ‘Classic, consistent, quality,’ and we have offered this holiday tradition for years,” Summers said. “So being able to offer the things they look forward to year after year is important for us. And we enjoy doing this. Santa Claus will greet guests from 9-11 a.m. at Snow Park Lodge. He will then appear from noon to 1:30 p.m. at the Silver Lake Lodge area. For information, visit http://www.deervalley.com.